There’s nothing worse than seeing your little bundle of joy going through so much pain and feeling helpless to stop it. While it affects them throughout the day, there’s no doubt it appears to get worse at night. If you’re struggling with night-time teething, don’t despair. 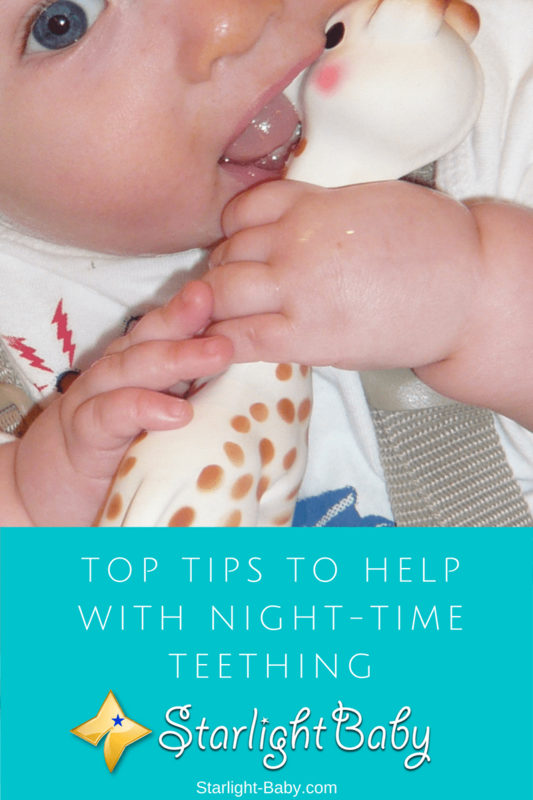 Below you’ll discover some of the best tried, tested and successful night-time teething tips that could just save your sanity and soothe your baby’s gums. Teething gel is designed to numb the gums, helping baby (and you!) get a good night’s sleep. However, many parents are reluctant to try it. Giving any type of medication to a baby can be worrying and it’s important to consult with a healthcare provider before choosing a teething gel. Tylenol and Ibuprofen gel tend to be the safest and most common teething gels used, but a healthcare provider will help you to choose the best solution. If you are going with this method, it helps to use the gel right after feeding time. So after you’ve fed them last thing at night, gently rub the teething gel into the gums. Provided you’ve chosen a reliable, proven gel, it should work for 4-6 hours. This gives you plenty of time to catch up on some sleep. Important note – When buying teething gel make sure it does not contain Benzocaine. This is harmful to babies, despite it being used in products such as Baby Orajel. It’s common to want to give your baby a break when they’re teething. After all, they’re in pain and it’s a difficult time so why not ease up on sleep training? The problem is, as many parents have found out the hard way, if you ease up on baby’s sleep routine, they could get out of it completely. That means, even when they aren’t teething, they’ll be used to you fussing over them when they cry throughout the night. As long as you know you’ve done everything to make them comfortable, they are fed and medication has been applied if you’re using it, you may try not giving in to every cry you hear. Give them time to settle and try to stick to the same routine as much as possible. After all, your baby develops teeth for up to two years. So unless you want to spend two years getting very minimal sleep, never give up sleep training completely. One thing you’ll notice is your baby will want to nurse more frequently when they’re teething. This is because it really helps to soothe the gums. Now again, you need to be careful not to nurse them too frequently throughout the night as it could lead to longer term sleep problems. However, nursing a little more frequently will help. There are a lot of teething toys on the market – and we plan on coming out with our own as well. These really help to soothe baby’s gums throughout the day. They will want to put everything in their mouth at this stage, but certain toys can make the gums even more sore. So make sure you’re using specialized teething toys. Frozen plastic teething rings are particularly helpful. If you have a few of them, you’ll always have a spare frozen ready for when they’re needed. As tempting as it might be, avoid giving teething toys to your little one during the night. While they can sooth the gums, they’re also going to distract your baby and prevent them from falling back asleep. A common side effect of teething is your baby’s temperature will rise. This can cause problems at night time as they struggle to stay comfortable enough to sleep. As a general rule, many parents find setting the temperature of their room between 61 to 68 degrees Fahrenheit (16 to 20 Celsius) is ideal. It’s helpful to use a lightweight blanket during teething so they don’t get too hot. Taking their temperature with an ear thermometer is also useful. Keep in mind that if baby’s temperature is over 99.5 degrees Fahrenheit (37.5 Celsius,) it isn’t a sign of teething and you will need to take them to the doctor. One thing you don’t typically associate with teething is a sore bottom. However, many babies develop loose bowels during teething, which can make their bottoms sore and red. This is thought to be because they produce a lot more dribble during teething which runs into the stomach, causing them to relieve themselves more frequently. Plenty of diaper rash cream will help to soothe the bottom during this difficult time. Out of all of the tips mentioned, this one is likely going to be the most difficult. There’s nothing worse than seeing and hearing your baby go through so much pain. Add to that the sleep deprivation and increased stress and you can end up feeling overwhelmed. However, if you’re stressed and upset, your baby is going to pick up on that. In turn, they’re going to become extra stressed themselves, leading to further crying and distress. It’s a vicious cycle, making it essential to remain as calm and relaxed as possible. When you start to feel yourself getting irritated, stressed or upset during night-time teething, take deep breaths It sounds ridiculous, but taking slow, deep breaths works wonders. Even just counting to 10 before you go in to tend to your baby at night can really help to make it easier. Overall night time teething is one of the most difficult things to go through with your little one. It can feel like it’s never going to end. However, the tips above will make a massive difference and help you keep a little sanity during this tough time. Remember, if you’re thinking of trying out medication, always seek advice from a doctor beforehand. Of course, if you have any of your own tips that you’d like to share, we’d love to hear them! Fill out the comment form below and let us know, because we could all benefit from hearing what you have to say! This sounds way too familiar, haha. Especially the sleep deprivation. We had constant battles of trying to get my baby back to sleep. He kept waking up and crying, it was exhausting for me and my partner. But it does get better, just have to be a bit patient. For us, personally, the thing that worked the best was one of those teething silicone rings. He loved it and kept trying to chew it. Another great remedy is what my mother suggested to me: Chamomille tea. It works wonders because it relaxes, calms and eases the pain a bit. Correct, Jane. We just need to be patient. Eventually, the tooth will come out and things will be back to normal. It is always ignorance that messes up situations.Teething is a phase that does need a different approach. All the suggestions given here if implemented could go a long way in taking care of this period in a relaxed way. Giving the baby something hard to chew is of great help. Indeed! A lot of the hassles with baby’s teething can be avoided if these tips are followed. Giving a baby something to chew on, as Jane mentioned, greatly helps relieve the pain. This should be a must for a teething baby. Wow, I forgot so many things since my child was a baby, now I must start all over again. I remember that my first son didn’t have any problems when its teeth started to grow, he didn’t make temperature as other children, he didn’t cry at all. Period of teething can be tough for both the baby and the mom at that stage in life for it makes the baby endure pain while his/her cry will give the mom some concern. The tips you listed is truly going to help mothers out there nursing their babies. I heard that the baby will have loose bowel during teething and he will also develop a fever. My baby is teething, he did not experience loose bowel however, he caught a fever. The doctor said we should feed “gripe water” to ease bowel movements. However, since the baby’s stomach is fine, we did not administer gripe water. We have bought a lot of teething toys.